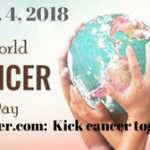 Lung cancer continues to be one of the most common cancers worldwide, claiming more lives yearly than breast, colon, and prostate cancers combined. It is estimated that lung cancer accounts for nearly one in five cancer deaths globally. In this World Lung Cancer Day, let us commemorate, celebrate and support those impacted by lung cancer. Join the grassroots efforts of the lung cancer community to raise awareness about lung cancer and its global impact, creating an educational movement of understanding lung cancer risks as well as early diagnosis and treatment around the world. Let’s kick lung cancer together!